This excellent, if rather expensive solution was arrived at after the design team was involved in a serious accident whilst taking a bend at 30mph in a swing axle Corvair (they were evaluating). These wishbones are generally sturdy and trouble free units unless suffering from accident damage or corrosion. Having basic front suspension (swinging arms) but a superior rear suspension (trailing arms) fairly neutralizes the usual 'tail-happy' handling of a rear-engined car. The swing-axle front suspension gives a high roll centre, which, in conjunction with a low roll centre at the rear, removes a lot of the weight-transfer loads from the rear wheels when cornering. The problem with cars with the engine behind the compartment is often that of a heavy tail-end, causing oversteer on corners (that is: the heavy tail flies out as you drive round). This was very evident in the VW Beetle with it's swing axle rear suspension, which encouraged the back wheels to tuck in and under as the recalcitrant tail of the thing swung outwards. The Imp's light engine, in conjunction with trailing-arm rear suspension means that this potentially dangerous oversteer characteristic is not present. 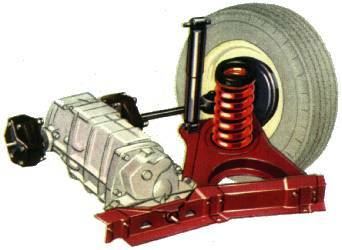 The Imp's rear trailing arms were developed by Harry White and a team of chassis engineers.